Today we are pleased to present middle grade author Melissa Sarno and her debut, JUST UNDER THE CLOUDS (Knopf Books for Young Readers (June 5, 2018). Be sure to enter to win a giveaway copy! I’ve been dreaming up stories ever since I was a little girl, always writing in secret while I pursued other things. I thought I wanted to be a journalist but soon realized I hated sticking to facts. I studied screenwriting thinking I’d move to California to be a television writer, but, instead, was pulled like a magnet to to New York. There, I worked at a toy company for many years, writing scripts for electronic toys and games for preschoolers. After writing some screenplays and novels that didn’t go anywhere, I had an idea for a novel about a girl who loved to climb trees. 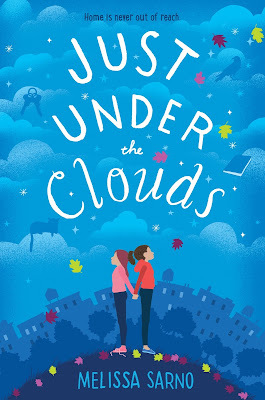 Her voice was younger than any I’d written before (she was 12) and, as I wrote, I felt like I found the perfect home for my narrative voice in middle grade.Congrats on your MG debut, JUST UNDER THE CLOUDS. Tell us about it and what inspired you. Thank you! 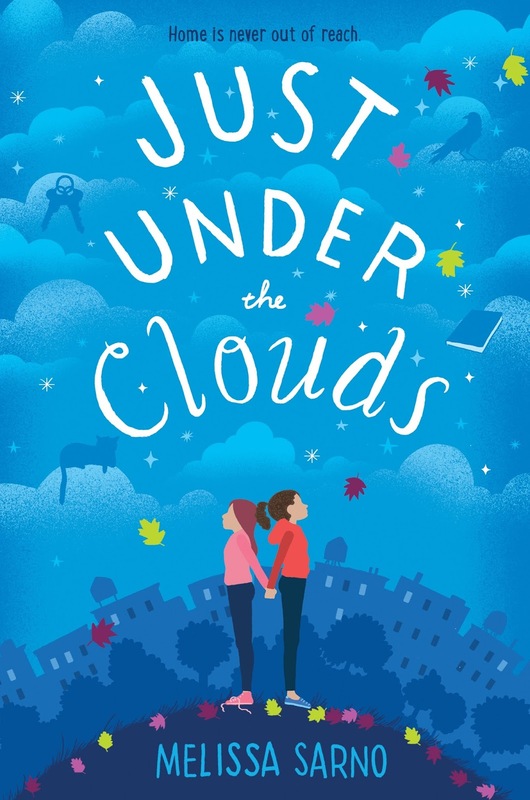 JUST UNDER THE CLOUDS is a novel for middle grade readers about Cora Quinn, a 12-year-old girl living in a homeless shelter in Brooklyn with her mother and sister. 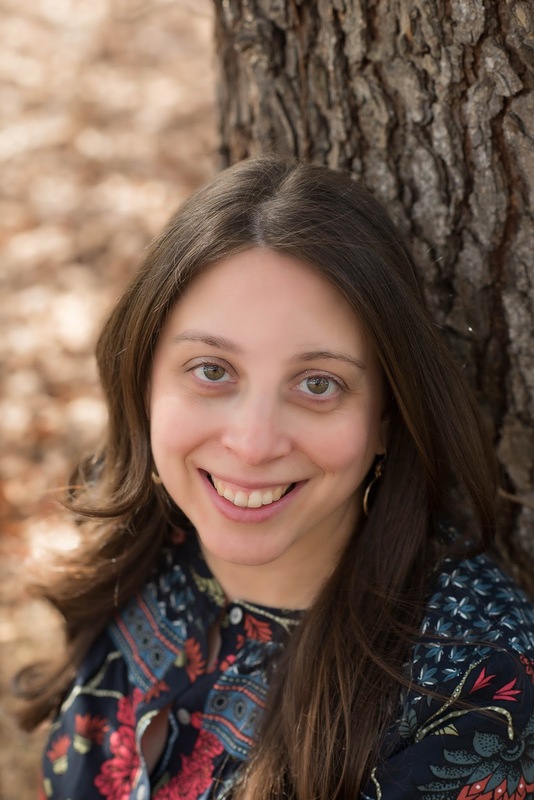 When their room at the shelter is ransacked, the family moves in with her mother’s old friend and Cora discovers “the tree of heaven,” a tree that can grow in even the worst conditions. It sets her on a quest to understand the true meaning of home. The novel was inspired by a lot of things but, especially, my love of Brooklyn, where I lived for eight years. I was wandering around Prospect Park when I saw a group of kids climbing a giant oak tree. I wanted to write about a city kid trying to find and climb the tallest tree in New York City. Gradually, I realized I wasn’t writing about a girl searching for a tree. I was writing about a girl searching for home. Your story deals with a tough topic, homelessness. How did you go about researching it? It was most important for me to write a story about a girl who happened to be homeless, rather than a book about homelessness, if that makes sense. I knew that Cora could not represent every homeless child’s experience, so I set out to explore the concept of home, which can mean many different things to different people. I did talk to some people who had experienced homelessness as children. And, when it came to understanding particular details about homelessness in New York City, this powerful and immaculately reported 5-part series in The New York Times, Invisible Child, gave me some great insight. It was definitely a windy, cross-country slog. Starting in 2006, I wrote, revised, and queried several novels that never went anywhere. In 2013, I found an agent and we went on submission with a YA novel that I re-wrote many times but never sold. Two years later my agent left the business and I found myself without an advocate for my work but with an early draft of what would become JUST UNDER THE CLOUDS. Early in 2016, I signed with a new agent and we went through revisions before that book sold in the summer, at auction, in just one week. Now we’re halfway through 2018 and it will be on the shelves! I am editing my second novel for middle grade readers which should be out in the world in 2019. It’s about the ocean and its secrets, and a 12 year old girl who was mysteriously found ten years ago on the beach. When she gets caught in a riptide and swallows a bunch of ocean water, she starts having strange dreams at night. She begins to explore what these dreams might have to do with who she is and where she came from. Writing can be hard. The industry can rocket you to the highest of highs and plummet you to the lowest of lows. Some days, the best thing to happen is to write just one sentence you love. Take the time to step back, slow down, and let yourself feel the joy of playing with words. I started writing when I was seven years old because there was nothing else to do on our home computer. Turns out typing little stories can be really fun! Thank you for sharing your story and journey! Congrats on your debut. Hopefully, it’s the first of many! I loved that the search for a tree became a search for home. It is amazing where our stories lead us! Sounds like a good story about a tree growing in Brooklyn! I'm excited to read this beautiful book. Middle grade fiction is so important and I'm blessed to have always been a reader. You have amazing perseverance and congratulations on seeing your hard work hit the shelves. Congrautations! This book sounds like a very good book to read, and timely with the increasing numbers of homeless living in our communities. Sounds like a good book to build empathy and understanding.